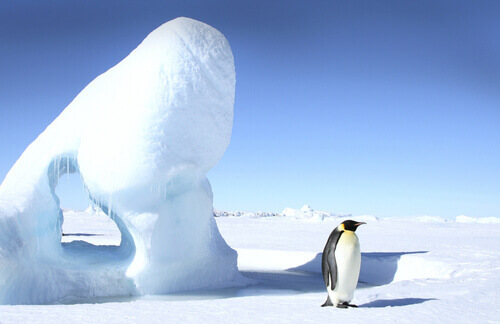 The South Pole or the Geographic South Pole as it is more accurately named, is the southernmost point of earth. It sits directly opposite the North Pole and is where the earth spins on its axis. In actual fact, the earth wobbles a lot more than we think and doesn’t spin on a single spot like a spinning top but the Geographic South Pole is the one place on earth, from which every direction points north. The South Pole is in the middle of a desert (there is surprisingly little snowfall in Antarctica) and it is 1,300km away from the nearest open sea at the Bay of Whales. Because it sits on top of an incredible 2,700 metres of ice, the high altitude makes it significantly colder than its northern counterpart, which sits just above sea level on just a few metres of ice. Furthermore, the centrifugal force of the spin of the earth pulls the atmosphere towards the equator leaving the air at the poles relative thin. Oh and did we mention it gets cold too? The highest temperature ever recorded at the South Pole was a balmy −12.3 °C, and if you’re wondering, the coldest was −82.8 °C. Not your average summer holiday. 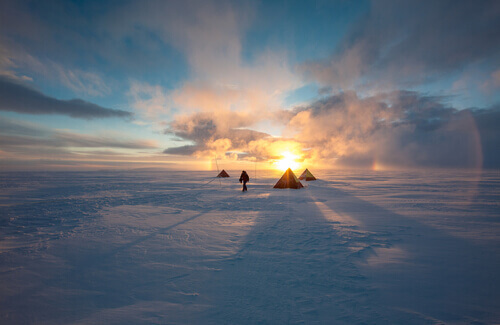 The South Pole receives no sunlight at all from May 11 to August 1 remaining completely dark. In contrast the summer from September to March never gets dark but the sun never rises high in the sky, keeping the surface cold and limiting the amount of snow melt. The hundreds of metres of ice below the South Pole is constantly shifting too. It moves about 10 metres per year, which means that a stake in the ground marking the actual South Pole itself has to be moved each year – which is done ceremonially every New Years’ Day. 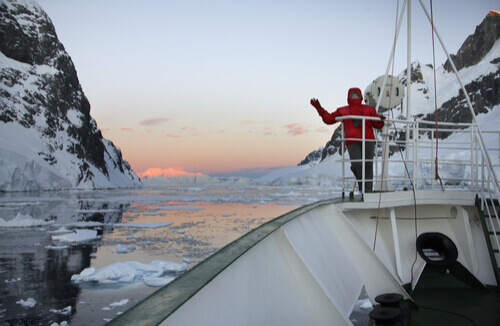 Since the discovery of Antarctica back in 1820 there have been a number of expeditions to try to find the South Pole. The first attempts were made by Robert Falcon Scott between 1901 and 1904. Scott, along with Edward Wilson and Ernest Shackleton got within 180kms of the Pole before having to turn back on New Year’s Eve 1902. It wasn’t until December 1911 that the first men reached the South Pole, with Norwegian Roald Amundsen beating Scott’s Terra Nova Expedition by a mere 34 days. Scott and his entire party famously died of starvation and cold on their return trip. The World Wars caused a long hiatus in polar exploration and it wasn’t until 1956 that another expedition was made by the US Navy. 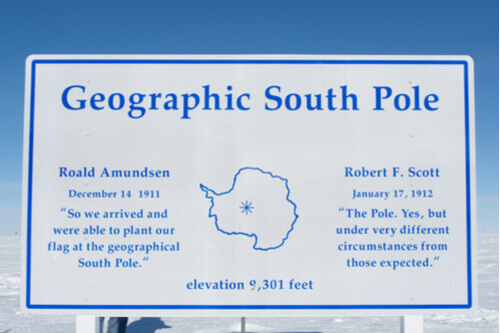 A station was established named The US Amundsen–Scott South Pole Station – after the first explorers to reach the South Pole – and has been continuously staffed ever since.